Tuberculosis was a disease that brought terror to the hearts of people over the years…especially right after World War II, but even before World War II, being diagnosed with Tuberculosis was like being given a death sentence. People had to be quarantined, so they wouldn’t infect those around them, since the disease is airborne. All too often it was too late by the time they knew they needed to be quarantined. Any serious disease can be scary for the people in areas affected, but this one was taken to a completely different level. 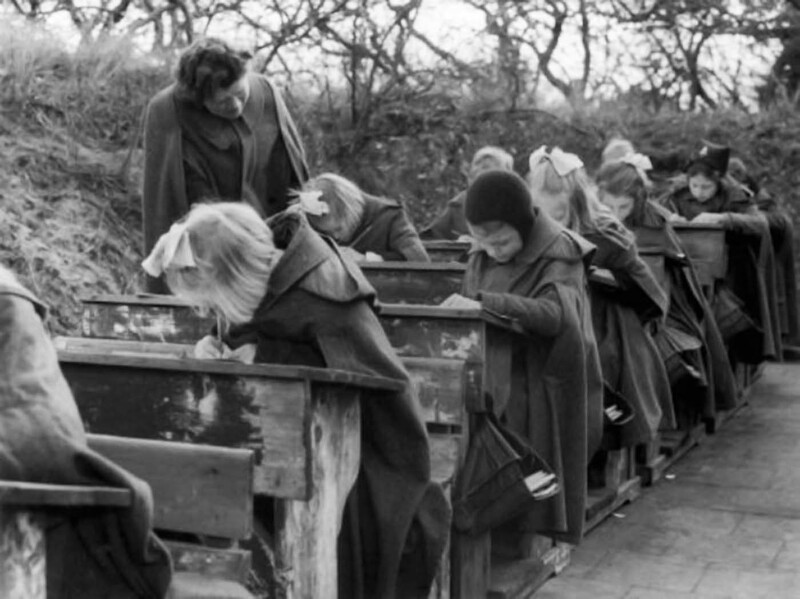 In an effort to prevent Tuberculosis from being passed from child to child, the schools began a new movement, known as the Open-Air School. The movement required the establishment of schools that combined medical surveillance with A method of learning that was adapted to students with pre-tuberculosis…an obsolete term for the pre-clinical stage of tuberculosis. The new institution was established by doctors researching new prophylactic methods, and educators interested in an open air educational experience. 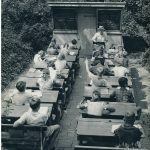 In 1904, Dr Bernhard Bendix and pedagogue Hermann Neufert founded the first school of this kind: the Waldeschule of Charlottenburg, near Berlin, Germany. 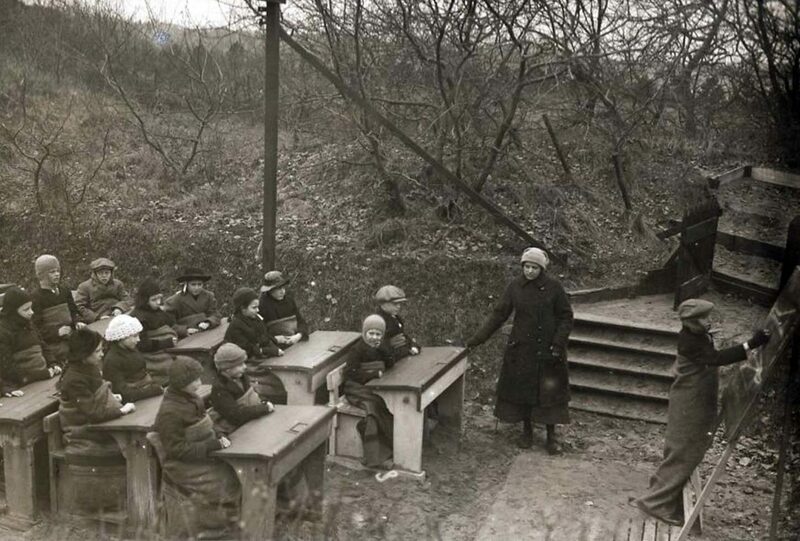 Classes were conducted in the woods to offer open-air therapy to young city dwellers with pre-tuberculosis. The experiment, conducted by the International Congresses of Hygiene, was immediately attempted throughout Europe and North America: in Belgium in 1904, in Switzerland, England, Italy, and France in 1907, in the United States in 1908, in Hungary in 1910, and in Sweden in 1914. The schools were called “schools of the woods” or “open air schools.” Often they were remote from cities, set up in tents, prefabricated barracks, or re-purposed structures, and were run during the summer. Some of the more noteworthy experiments were the School in the Sun, in Cergnat, Switzerland and the school of Uffculme near Birmingham, England. The School of the Sun used helio-therapy in 1910. Dr Auguste Rollier sent the children up to the mountains every morning equipped with portable equipment. The school of Uffculme, noted for its architecture, allowed each class to occupy its own independent pavilion in 1911. After World War I the movement became organized. The first International Congress took place in Paris in 1922, at the initiative of The League for Open Air Education created in France in 1906, and of its president, Gaston Lemonier. There were four more congresses: in Belgium in 1931; in Germany in 1936, marked by the involvement of German doctor Karl Triebold; in Italy in 1949; and in Switzerland in 1956. National committees were created. Jean Duperthuis, a close associate of Adolphe Ferrière (1879–1960), the well-known pedagogue and theorist of New Education, created the International Bureau of Open Air Schools to collect information on how these schools worked. Testimonies described an educational experience inspired by New Education, with much physical exercise, regular medical checkups, and a closely monitored diet, but there has been little formal study of the majority of these schools. According to the ideas of the open air school, the architecture had to provide wide access to the outdoors, with large bay windows and a heating system that would permit working with the windows open. The most remarkable of these schools were in Amsterdam, Holland by architect Jan Duiker (1929–1930), in Suresnes, France by Eugène Beaudoin and Marcel Lods (1931–1935), and Copenhagen, Denmark by Kai Gottlob (1935–1938). From what I have seen, most of these school were held completely outdoors. I don’t know if the impact on Tuberculosis was as profound as they had hoped, but there were good things that came out of the experiments. The movement had an influence on the evolution of education, hygiene, and architecture. School buildings, for example, adopted the concept of classes open to the outdoors, as in Bale, Switzerland (1938–1939, architect Hermann Baur), Impington, England (1939, Walter Gropius and Maxwell Fry), and in Los Angeles (1935, Richard Neutra). 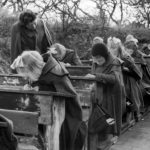 This influence is the major contribution of the open air schools movement, although the introduction of antibiotics, which increasingly provided a cure for Tuberculosis, pretty much made them obsolete after World War II. Nevertheless, fresh air, exercise, and playtime for young children have all remained an important part of the school day, and thankfully, Tuberculosis is on the decline, although it still ranks in the top 10 of fatal diseases.